In my continued dedication to highlighting the supporting cast of film and TV, especially the ones that have been featured in Hallmark movies, I bring yet another brilliant and shimmering star to your attention. Elizabeth Weinstein is an up and coming actress in Vancouver who was recently featured in one of the top-grade films that Hallmark recently premiered, Love At First Dance. Upon further research, I realized just how extensive her work was within the industry as a whole, and when I reached out to her for an interview, she was honored. In this case, Elizabeth was gracious enough to be as flexible as possible when I unwittingly missed our first scheduled interview, and I am thrilled to present this delightful woman to my readers today. RH: Elizabeth, so nice to chat with you today. EW: Hello Ruth! Thank you so much for chatting with me. RH:Why did you decide to become an actress and what kind of training have you had? EW: Interesting question to start with. I don’t actually remember ever deciding to be an actress. I just always knew. I was one of those weirdos that just always knew what I wanted to do and was super focused on succeeding. I remember being four years old and telling people that that was what I was going to do with my life. I think it stemmed from growing up on an isolated farm on Vancouver Island in the middle of a forest. We had to be creative to entertain ourselves on the farm and being the youngest of four, you have to be extra loud and emotional to be heard. Kidding…kinda. As far as training goes, I started doing theater in school, I remember doing a run of Alice in Wonderland for all the elementary schools. I played The Red Queen and The Mad Hatter, and at the end of the play a few of the kids would run up and kick me. I remember thinking “Awe, that’s the sweetest compliment ever.” Because those kids believed me so much. I directed a high school play in grade eleven and moved to Vancouver at the age of seventeen to study acting and to get an agent. I graduated from a year-long acting program at eighteen and started auditioning. I still train here and there, but now it’s more like private coaching. I don’t think we should ever stop trying to hone our craft. RH: What was your first professional acting job and what are your memories of it? Anyway, when I got in the room, I had three pages of Sci-fi lingo that was broken English and barely made sense, but the reader started reading and it was the wrong line. (I started to panic!) Then I said my line and the reader said hers, but none of it made any sense. I hit full-blown panic mode and just pushed through with what I had prepared. After the audition, I sat on the couch in the hallway, stunned, and looked over my pages, and I had stapled them BACKWARDS!! I was reading the scene in reverse. I was so mortified I cried all the way home. When I got home, I found out I booked it!!! I couldn’t believe it. Just goes to show you even when you think you were terrible if you are right for the role, you are right. RH: I see that you have done some stand-in work. How do you think that has helped your career? EW: Oh my gosh!! Stand-in work has taught me everything about the machine of a film day. Learning how to be a good actor is one thing, but being technically skilled in this industry is equally as important, I think. Understanding camera framing, lighting, focus pulling, and just overall set protocol is invaluable. At the end of the day, it really is a technical industry. I could tell when actors came in and didn’t stand on their marks (which meant they weren’t lit properly and the focus might not be clear on them) or when the continuity was off, which is a struggle to edit. I mean that training is indispensable, not just for getting comfortable in a set environment, but watching people work and seeing what works and what doesn’t. And how the pros allow themselves to take up space and take risks. RH: You’ve worked on two pretty big films–Rise of the Planet of the Apes and Tomorrowland. What did you enjoy about working on those projects? EW: Well, on Tomorrowland, I was a stand-in for the duration of the film and got to watch incredible actors work. Like Judy Greer, Kathryn Hahn AND this sort of unknown guy, George Clooney? Know him? Just a dude that played fart noises on his phone app every day and giggled like a schoolboy. An absolute thrill to be able to sit back, watch and learn. Working on Planet of the Apes changed my life. I was actually only on set for one day, but I had a scene with Freida Pinto, James Franco, and Andy Serkis. Most people might not know who Andy Serkis is. He played Gollum in Lord of the Rings and changed the face of Motion Capture forever. He was playing the ape in the scene with me and it was my first introduction to Motion Capture. His full physical commitment and talent was mind-blowing to watch. He morphed from human to ape in front of me. That’s when I knew I wanted to learn that skill and get into that world. Since then, I have been blessed to have worked on three Video Games with EA. One I have been working on and off for almost three years. I can’t say much more about it till it comes out but it changed my life. RH: Hallmark viewers first saw you in Garage Sale Mystery: The Deadly Room. What was your experience filming with that cast and crew? EW: Garage Sale Mystery was so much fun!! I was reunited with Peter DeLuise once again fifteen years later, and the whole cast and crew was amazing. I have worked on a few Hallmark MOW’s since then and the beauty about working on Hallmark is the energy on set. They hire, I’d say, 80% of the cast locally and the crew is almost all local, so the community and the vibe is always awesome, like coming home. Plus Hallmark shoots so much here in Vancouver that they really give us a chance to showcase our local talent. Everyone is always so grateful to be there and to be working. RH: We also got to see you in The Art of Us and more recently, Love At First Dance. Any special memories from either production? EW: YES!! The Art of Us was such a pleasure. I played Lisa Whitney the wife of the Dean and quite a proper wealthy woman who is prominent in the art scene. 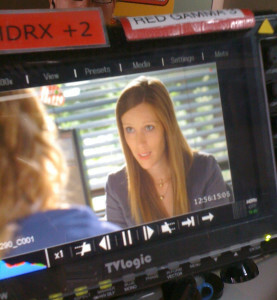 One of my favorite things about Hallmark is the kind of characters I get to play. I often play a distinguished and refined woman with expensive clothes and jewelry that are actually nothing like me. I am a baseball cap, t-shirt and jeans kind of woman, so it is complete dress up time. Love at First Dance was one of the most entertaining characters I’ve gotten to play. I play Dinnie Forsberg, who is a wedding planner to royalty. She is bossy, demanding and takes complete control of the wedding with the two overbearing moms to the reluctant bride and groom. First of all, the screenwriter Nina Weinman Swift (who I saw you interviewed) wrote really boisterously fun characters to play. The delightful director Marc Jean and superb producer Joel Rice were fantastic to work for. But what really stands out for me was the star, Niall Matter. He was the most generous and kind lead actor I’ve worked with. He made it so comfortable for everyone. I truly hope I get to work with him again, with all of them. RH: Any current/upcoming works you would like to share? EW: I am currently shooting a big feature film called Needle in a Timestack. Director John Ridley- who won an Oscar for 12 Years a Slave and Leslie Odom Jr.- who won a Tony for the Broadway hit Hamilton. It also stars Orlando Bloom, Freida Pinto (who I worked with on Planet of the Apes) and Cynthia Erivo. It’s a star-studded cast. When I read the script, I flipped out. It’s so good. It’s in the Sci-Fi genre. A film about a husband whose marriage is destroyed by time travel and he will do whatever it takes to get his wife back. It’s based on a short story written in 1966 by Robert Silverberg. John Ridley read the story in 1986, and has wanted to make it into a feature film ever since. It is definitely a passion project on all fronts. Which creates a cast and crew of people that are all very dedicated to the project and show up completely. I am very excited about this one. I also just finished a Lifetime movie written and directed by Shawn Tolleson. It’s going to be a really endearing Christmas movie that I’m sure I will be able to talk about closer to the release. Not even sure if I can say the name since it hasn’t been announced yet. RH: As you’ve done some work behind the camera, is that something you would like to pursue further? Any plans to write/direct/produce? EW: I have to say, I have wanted to write a feature and attempted it a few times but man, it’s hard. I don’t have the natural writing chops. I do see myself directing in the future, but I am not there yet. I just have to keep my eyes open and keep watching and absorbing as much as I can every chance I get. RH: As a woman in the business, have you experienced gender bias? How have you seen things changing for women in the past few years? EW: I absolutely have, but I experienced it more working as crew than as an actress. I have worked with more and more female directors and female crew members in the camera and grip department each year and having that feminine energy on set has made a huge difference. Times are changing and it is so nice to witness. RH: When not working, what do you like to do for fun? EW: I do juggle five different jobs in film, so there is not a lot of downtime. But when there is, I ride my bike to the beach for a swim or I have a nap under a tree with a book. I have a bed in the back of my SUV, so when I can, I like to drive out into the forest and light a fire by a river or a lake and decompress. Reminds me of life growing up on the farm. RH: Elizabeth, I so appreciate your time! And your flexibility. It is an honor to feature you. EW: Thank you so much for having me and helping us stay connected to the Hallmark fan base. They are truly the best! The industrious nature and stalwart work ethic that Elizabeth absolutely exemplifies in every area of her life is certainly a testament to her eagerness to do whatever necessary to further her prospects and opportunities within the entertainment industry. Not one to be daunted by challenges of any kind, Elizabeth continues with tenacious determination to take advantage of every possible occasion to sharpen her skills, portray a dynamic role, and embrace every on-set experience, no matter the size or scope. She is one who consistently demonstrates her ability to be a team player, and her knowledge of the film business potentially rivals some who have been in the business for decades. Her faculties are quick and her senses are attuned, no matter what role is placed in front of her, and there is no doubt that when she is on-screen, she will not be overlooked. While she doesn’t go out of her way to artificially insert herself within the production nor draw undue attention to herself, her innate talent and invested work speak for themselves. She is a true gift to the film industry, and I can hardly wait to see what the future holds for her. If you have not seen her in Love At First Dance or in any of her other eminent works, I would invite you to do so at your earliest convenience. Furthermore, why not click on all her links below and give her a follow on Instagram? As more significant roles seem to be heading her way as the months and years go by, I revel in the profound giftedness of this authentic soul who is as generous and talented as they come! Every year at this time, hordes of actors head to Los Angeles in hopes of being cast in a successful network television series. This week, we profile some of the intrepid Canadians competing for a chance at fame and fortune on the small screen. LOS ANGELES – Dingle balls have been lovingly applied throughout the interior of Elizabeth Weinstein’s van. The pompom trim rims the windshield as well as the ceiling and is a shade of mauve that perfectly complements the iridescent blue padded walls and long-pile rug. On the platform bed is a leopard-print blanket, and under the bed are baskets for the 26-year-old actor’s shoes and sweaters. A small, three-drawer dresser holds the rest of Weinstein’s clothes and she even has a laundry basket. The curtains are made from beach mats and there is surround lighting and surround sound. The bar fridge runs on a separate battery that recharges when she drives. It’s a cozy set-up and Weinstein took her time customizing her home away from Vancouver while seeking acting jobs in Los Angeles. Her current address is the oceanside parking lot in Venice Beach. This coincided with a breakup with her boyfriend, so Weinstein moved out of her house and into the van and headed down the coast to L.A. Her ultimate goal is to get a manager, which she says she can’t pursue quite yet as they won’t see anyone until pilot season has completely wrapped. She also needs to get a phone and hopefully some bartending work under the table — she’s living off her credit card, but not a working visa. Weinstein has worked as an actor for the last eight years, but says she had trouble getting more than one line on shows such as Cold Squad and Stargate because most of the casting was done in L.A. The rest of the roles — mostly of the “Can I get you a drink, sir?” variety — were reserved for Canadians because of Canadian content laws. “That’s why all the Canadians come down here to audition for shows shooting up there,” explains Weinstein. “And that’s how I’m justifying not getting a working visa, because I’m not planning on booking anything shooting here. If I audition for the stuff working in Canada then I’ve got a better chance than an American going for that,” she says as The Police’s Roxanne blasts from the speakers. One might be inclined to wish Weinstein had applied the same dedication to planning her career as she did to applying dingle balls to her van, but she says, winging it is part of her plan. At night the beach is closed so she drives to a nearby residential street, draws the blinds and goes to sleep.